2017 saw the release of Dödsrits' self titled debut album. I was impressed by the quality that I discovered on that album. Had I found it earlier it would have made my yearlist, no doubt. It is also an album with staying value. I still come back to it on a regular basis. I could not be happier to hear that Dödsrits' new album was available for review. Unfortunately for me it is not able to reach the same heights it predecessor reached and thus left me a bit disappointed. Please allow me to tell you why in this review, but before doing so, let’s go through some general info, for those not in the know. Dödsrit is a one man band from Sweden. It’s the musical outlet for Christoffer Öster, who was a part of highly acclaimed crust band Totem Skin. 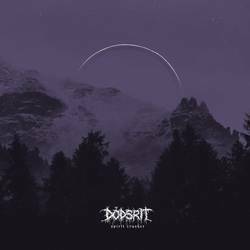 On Dödsrits' debut album those crusty roots were clearly audible, but mixed with an unhealthy dose of black metal and a dash of post metal. Where most one man black metal bands I know dable in (extremely) lo-fi productions, Dödsrits production is clear, although a bit loud. The crusty d-beat mixed with black metal made up for some very aggressive music, where the occasional post metal parts gave some space to breath. You can imagine this leads to longer compostitions. The debut album contains four tracks and lasts for about half an hour. Spirit Crusher is similar in structure compared to the self titled album. It uses the same ingredients and has four tracks. The first big difference is a drastically increased run time. Spirit Crusher clocks in at 44 minutes. This means, logically all tracks last longer. That’s where the trouble starts. As I pointed out, stylistically nothing much has changed. There’s a certain ebb and flow where aggressive black metal is countered by more mellow post metal. On the debut the balance was perfect. On Spirit Crusher it’s not. I did not time things, but after spinning this album a dozen times my gut feeling is: the extra time is filled by post metal. That would not necessarily be a bad thing. There’s more than a few post metal albums that I really like. My problem with the increased build ups is that most parts don’t really work towards anything much. It feels to much as filler. Take album opener "Aura" for example. The track starts promising with a nice blackened riff and some blast beats thrown in for good measure before skipping to d beat territory. Then around the three minute mark we are treated to the first post metal part. This last for about three minutes before going back, by an unlogical transition, to heavier territory. The song then ends with another post metal part that doesn’t really seem to go anywhere. I could describe the other three tracks, but lets suffice by saying that they suffer from the same symptoms. This makes for a bloated album. Does this make this a bad album? No, not by a long shot. Considering the high standard set on the previous album, the lack of self editing is disappointing though. I try not be to tough on Dödsrit, as there’s plenty to enjoy on Spirit Crusher. You just have to bite through unnecessary parts. I’ll score this 70. Not too bad, until you consider the 90 the debut scored. Posted Oct. 22, 2018, 10:46 p.m.